Wendy Werneth October 31, 2014 October 9, 2018 Cooking, This post may contain affiliate links. Happy Halloween everyone!. Guess what? I made this! 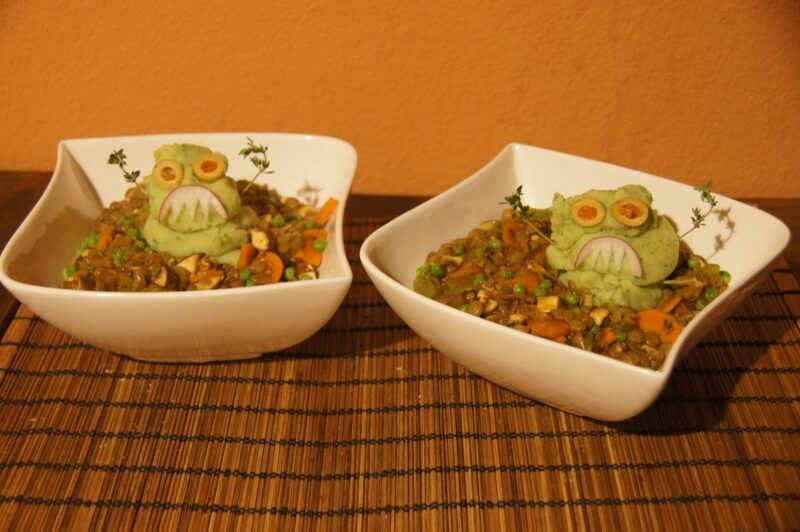 It’s Monster Mash! 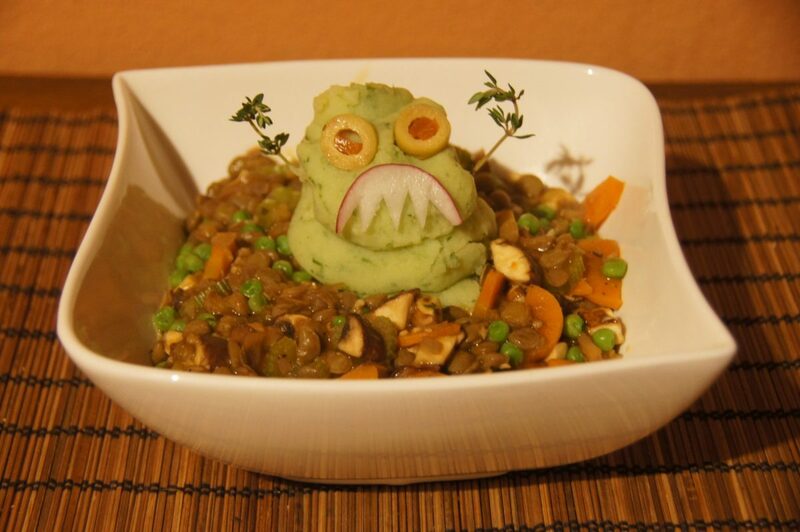 Monster Mash Shepherd’s Pie, to be precise. I certainly cannot take credit for coming up with this brilliant idea – it was Isa Chandra Moskowitz of Post Punk Kitchen who did that – but I’m pretty pleased with the fact that I was able to recreate it. This is the first time I’ve ever cooked anything creative like this, and I had visions of it turning out like one of those images you see in viral lists of Pinterest fails (this rubber ducky cupcake massacre comes to mind). Have I mentioned that, until a few months ago, when I first became interested in healthy eating, I had virtually never cooked before? I grew up in a family where no one cooked. As a young child I lived mostly on Hamburger Helper meals from a box, Chef Boyardee pasta from a can, and Kraft Mac&Cheese with hot dogs. As I got a bit older I began to fend for myself, which usually meant microwave dinners and Hot Pockets. Later, when I moved to Europe, I definitely learned to appreciate the taste of good food, but I still never acquired any desire to make it. I was so used to the instant gratification of being able to throw something in the microwave when I got home and sit down to eat five minutes later, that cooking anything beyond toast just seemed like an unnecessary chore and a waste of time. I was very thankful to have married a man who loved to cook and who knew how to whip up delicious and healthy meals, and I was quite happy to let Nick prepare all our meals at home. At work for lunch, though, I would buy a sandwich or bring with me, yes, a microwave dinner. And then, in April 2014, all of this suddenly changed. I somehow stumbled on the Food Revolution Network run by John and Ocean Robbins, and I became aware of all the added sugar, salt and chemicals in the processed food I was eating and all the ways they were damaging my health. I decided I would try making my own whole-foods-based lunches on occasion. I figured I would start out slowly, just once or twice a week, and gradually try to work my way up from there. Except that after the first day I was hooked. It felt so good to be eating healthy, whole foods and to be in control of what I put in my body that I made my own lunches every day from then on and never looked back. I was cooking only vegan food, as, for reasons relating to health, environmental concerns and an unhealthy desire to lose weight, I had decided to try my own version of Mark Bittman’s VB6 (Vegan Before 6:00) diet. I had no idea at that point that I would become fully vegan a few months later, and that I would do it for the animals. I still don’t have much of an intuition for cooking; I follow recipes to the letter and freak out if I have to replace an ingredient with something else. But, for the first time in my life, cooking is FUN. I love discovering new foods from recipes posted by bloggers, I love the feeling of accomplishment I get from making something from scratch, and I love mixing a bunch of ingredients together and then seeing that, lo and behold, it’s actually going to turn out in the shape it was supposed to be in. Like these guys did. And you know the best part? My Mom, the one who raised me on Hamburger Helper and always hated to be in the kitchen as much as I did? She’s discovered the joy of cooking too! We exchange recipes and talk on the phone every week about the meals we’ve been making. We also talk about our love for animals and about veganism. Mom also became vegetarian a few months ago, and when I spoke to her last week she was eating around 95% vegan and was about to head to the grocery store in search of non-dairy yogurt and ice cream to help her make the final stage of her transition.